As part of my ongoing work with the Mixed Reality Lab and Horizon DER at Nottingham University I was commissioned to come up with an augmented reality, paper based, activity pack or object that incorporated their Artcodes pattern recognition system. MRL wanted to create something to help them with their ongoing research into the social aspects of pattern recognition technology. Ive been working with Artcodes on and off for a couple of years and am interested in seeing it develop more so that it can be used more widely by people to share and author their own digital content. I’d like to use it in some of my public art projects and work with groups and organisations so I was keen to use this commission to research more about how and why people might use this kind of system, what works and does not and where or how it can be socially useful. 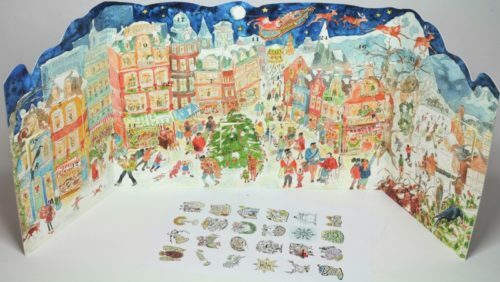 I researched and mocking up various festive ideas for traditional decorations, cards and advent calendars, we tried these out and decided to go with the advent calendar, Advent Calendars are very familiar and fit with the idea of the codes opening digital doors. A nice calendar is a treasured item that many people use year after year and this fitted with my thoughts about it being something people would want to have out and play with, and could share and use again. 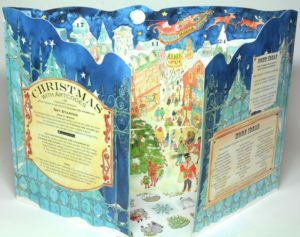 I designed and illustrated it as a freestanding, gatefold calendar with 24 opening doors. It is traditional in style and features scannable Artcodes to use with the Christmas with Artcodes app. 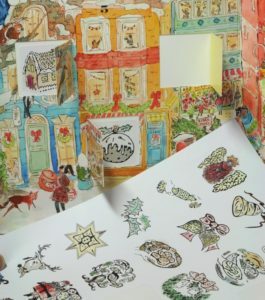 The calendar comes with 24 Artcode stickers to put under any doors . When scanned, using the Christmas with Artcodes app, these codes open photos, videos and other media. People could personalise and replace all the content by adding their own (photos of text, images, drawings, sound, video, urls etc) and share their digital layers with other calendar owners who could view the digital layer created for them. Everyone with a phone or tablet can use the same calendar and create their own digital layer. I’ve been surprised by the range of uses people found and in particular the empahsis on using it to make a connection with people isolated or far away. Those uses included making a calendar for a friend having a long term hospital stay; making calendars of family memories, and having your own calendar whilst sending one overseas to share christmas messages between family far away. A lot of what the team are discovering is about the language and processes that make sense to one person but are confusing to another. When you take a risk and invite people to try out a new technology the uses people find for defy your imaginaton, they find unusual ways to use things and uses for things. If people are not creatively involved in development of technologies it can limit the potential for those technologies to develop in useful social ways.